FORT MITCHELL, Ky. -- I was surprised that after writing about more than 300 homes over the past six years that a home could surprise me as much as Bud and Linda Roe's Fort Mitchell Place condominium. From the street, their two-bedroom, two-bathroom, 1,200-square-foot home is classic 1980s: prominent garage, simple all-American architecture, pathway leading through a narrow entry to a glass storm door. But when Linda lets you in -- POW! -- it's Christmas time in a Rocky Mountain log cabin. "I'm not bragging, but everybody who walks in here -- the Pete's delivery guy or the UPS guy -- are all amazed," Linda said. "People are always telling me 'Oh my god. This needs to be in a magazine or on TV or something.' "
Our photo gallery backs up the truth in that remark. The story of how the Roes converted a character-challenged space into a mountain-y masterpiece enriches that truth. Bud Roe transferred from Eastern Kentucky University to Morehead State in the late 1970s and fell in love with a picture of a girl -- "the most beautiful girl I'd ever seen" -- who had just graduated. Eighteen years later, after he had become wealthy in the bar and oil business but lost much of it when the petroleum market plummeted, Bud finally met the woman in the black-and-white picture he keeps in his wallet. She was Peach Grove, Kentucky, native and career Delta Air Lines flight attendant Linda Rardin, who was living in a Fort Mitchell condo she shared with her sister. She had never married and neither had Bud. They dated for several months, took a two-year hiatus, and then got back together. Bud is a self-proclaimed country boy who grew up in Greenup, Kentucky, about 20 miles up the Ohio River from his birthplace in Portsmouth, Ohio. The son of a railroader and carpenter and relative of many a musician, he wears a cowboy hat and boots, is handy in his wood-shop garage and writes music on the side. Bud sang a self-written proposal, and Linda said yes. They married in 2000, and Bud's dozen-plus groomsmen wore cowboy hats at their church ceremony. Linda's sister moved out, Bud moved in, and the couple began dreaming of owning a log cabin in the country. When the housing market crashed, so did their dream. It was Bud's idea in 2013 to panel one wall in their living room with half logs of tongue-and-groove knotty pine. "My first thought was, 'You've got to be out of your mind,' " Linda admitted. Bud forged ahead, buying custom-stained logs from an outlet in Michigan. The couple liked it so much, they continued paneling the walls in the living room, then up to the second floor and, finally, into a first-floor master-bedroom suite they converted into a 21st-century version of an Old West saloon. "l liked it so much, I said I wanted to do it in the bedroom, and now it's everywhere," Bud said. "We kind of did it by the seat of our pants." And they integrated what Bud calls "lick-and-stick," manmade stone into their living room fireplace and window casings. They replaced the 1980s stamped ceilings with replica barn wood, trimmed the doors with wood from Linda's father's barn and installed rough-hewn cedar cabinets in their galley kitchen. Linda's antiquing of the interior's six-panel doors completed the mountain-cabin look the couple desired. The project took the better part of four years and kept Bud busy while he was on seasonal furlough from his job with the Internal Revenue Service. "It took us that long, but people kept loving it, and we kept going," Bud said. "It's pretty cool, and most people think that. And that's what we want them to think." Many of the structural-design elements -- such as the bar top made from an antique Hamilton piano, complete with its keyboard, recessed pocket shelving near the top of the 13-foot-high vaulted ceiling in the saloon, and a wall that enclosures the upstairs master bedroom suite -- were Bud's ideas. Because he was an avid fan of Pinterest, the internet was his go-to place for inspiration. The two said they worked together seamlessly to integrate antique furniture, Linda's dad's old tools and other decorative accessories they found when cleaning out her parents' estate. The Roes also frequent local flea markets such as the Burlington Antiques Show in Boone County. Linda loves the hand-carved, horse-head chair she bought for $65 from its maker at Burlington, but Bud's favorite is a miniature horse and carriage that Linda adorned in Christmas attire for the first time this year. "All this stuff in this whole house, and that iron carriage there, that's what you pick?" Linda asked Bud. More logically, one would think his favorite object might be one of his rifles or the stuffed head and hide of an elk his brother shot in Colorado that hangs high in the stairwell. Or perhaps it should be a light fixture over the bar that Bud made of five bourbon bottles, the outside two being vintage Pappy Van Winkle. He said he couldn't find any of the outrageously popular Pappy to buy, but he found the two empty bottles on eBay and purchased them for $30. The bottles fit in with the saloon's decor, which includes 14 of Bud's cowboy hats, two cowhide-backed bar stools, two longhorn cattle racks draped in evergreen-and-ribbon swags, a narrow Christmas tree with multiple miniature liquor bottle decorations and a lazy Susan that displays a complete set of eight Blanton's bourbon bottle stoppers shaped like racing thoroughbreds. 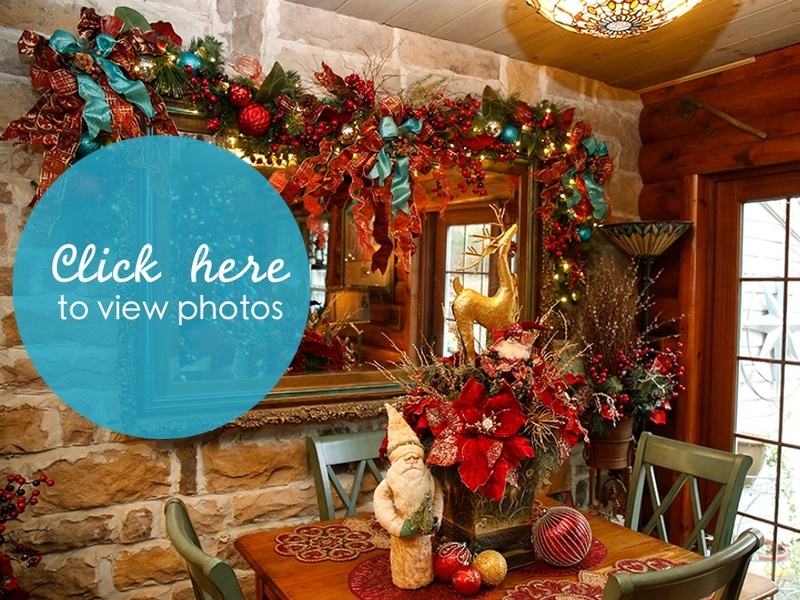 Linda, whose friends and acquaintances hire her to decorate their homes at Christmas, is in charge of the holiday fare and goes all out with garlands and greenery in almost every nook and cranny. She starts decorating around Halloween and usually is done a week before Thanksgiving. Her centerpiece is their 9-foot high, artificial tree in the corner of the living room that pokes up into a square well that extends to the roofline. They used to cut live Fraser firs, but one lost its needles before Christmas, and its replacement fell over, prompting them to go with an artificial tree. The tree has so many bright modern balls and antique decorations, its green needles are barely visible. Luckily for the Roes, their neighbor has extra room in his garage to store their many boxes of Christmas decorations. The alternative would be for Bud to sacrifice his garage workshop, which would be a painful and difficult project. One of the few projects left for the couple to complete is remodeling their double master suite bathrooms. Their plan is to fashion vanities out of empty Kentucky bourbon barrels.